Size: If you need to be able to take your photo printer with you on the road, consider getting a portable device, such as the HP PhotoSmart A630. If you plan on keeping it on your desk or table, a regular size model should suffice. In any case, make sure the unit will fit in your available space. Expandability: A number of printers on the market are loaded with features that can be upgraded or offer add-ons that are sold separately. For instance, if the built-in memory is just not big enough for the increasing number of photos you are printing, many machines allow you to add more RAM. This could be a beneficial feature if there is a potential for growth. Quality: Though photo printers in general will produce quality that is ‘good enough’, if you are a professional photographer, you will want to spend a little more money to get the utmost quality. Check the maximum resolution – if it is above 1200×1200 dpi, the quality should be very good. Functionality: A standard photo printer can deliver high-quality images, but what if you want to make a copy of a picture or scan an old Polaroid into your computer? If you think you will use scan and copy functions in addition to printing, be sure you get an all-in-one machine. Connectivity: Some of the first photo printers only offered USB connections, meaning you would have to load your pictures from your camera to the computer and then print. Most new models, though, have PictBridge ports for direct connection to cameras, and media card slots for printing directly from your camera’s media card where images are stored. 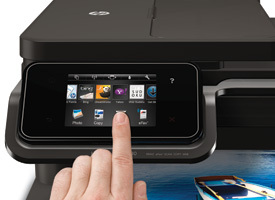 Edit your images before printing directly on the photo printer’s LCD display! LCD/Editing: If you prefer to be able to print straight from the camera, a big, color LCD screen with editing features is important. Though you can make a few adjustments to images on the camera menu, having a full-featured LCD screen gives you the opportunity to perfect each photo before printing. Cartridges: Black, cyan, magenta and yellow are the standard colors used for color printing, however, many photo printers have upped the ante on this. Some come with specialty photo cartridges for black-and-white or color printing, some include light versions of each standard color, and some introduce new colors, like red or green. The more colors that are used, the more vivid and true-to-life each photo will be. You should also be conscious of the extra replacement cost, however. 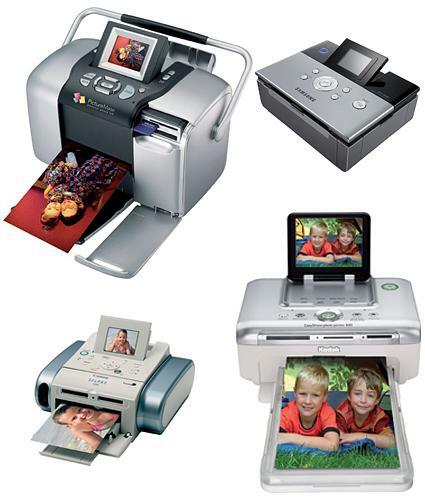 Media: Photo printers vary in the size and types of media that are supported. If you want to print panoramic pictures, you have to get a printer capable of that. If you want to print transfers for clothing or ID cards, check the paper handling features to find out the various options for each unit. TIP: Using special photo paper will noticeably enhance your images. Capacity: All printers have a maximum monthly duty cycle, which represents the most pages that can be printed without running the risk of burning out the printer. Only you know how much you print on a daily basis, so be mindful of the duty cycle when you purchase a photo printer. As you can see, there are a number of aspects to examine before choosing a photo printer. These machines are designed to last for many years, so you want to find one that will fit your needs now and in the future. Not all of these elements are going to be relevant to everyone, but hopefully this can give you a better idea of what you should be looking for.